I had no idea how spooky Pennsylvania drive-in theaters can be. Not until the last time I was there. The experience of watching a movie outdoors is an experience like no other. 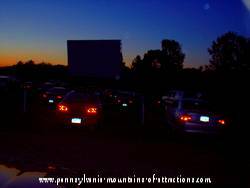 Drive-in theaters have been a popular family attraction in the Allegheny Mountains as long as I can remember. Back when I was a kid, people would load up the back of their old woody station wagons with neighborhood kids and off to the drive-in we would go. You just couldn't beat free admission for children under 12 years old. We would spread a blanket on the ground and buy a huge box of popcorn and we were set for the night. In those days we didn't have air conditioning , cable, or satillites in our homes. The cool fresh night air was always a welcome relief away from our hot houses and city neighborhoods. Even back then, I can remember an uneasy feeling creeping over me after a certain time of night. It is hard to explain that feeling, but I know it wasn't just me that was feeling uneasy. One by one, all the kids would pile back into the station wagon to watch the second feature. It didn't matter if we didn't have room to breath, we were happy to be inside. Even adults love intermission, at the drive-in theater. 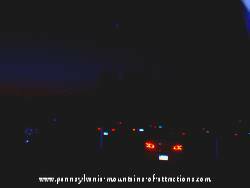 The entire field lights up and it's a great opportunity to step out of your car and stretch. I'm not sure which line is the longest, the refreshments stand or the restrooms. Long before you step out of your car you will smell fresh popped popcorn, hot dogs roasting, french fries frying, and the unmistakable aroma of pizza. Even families that bring their own snacks will stroll down to the refreshment stand just to see who they know and take the time to mingle. Some Pennsylvania drive-in theaters have playgrounds for children. When you are sitting outdoor on top of the Allegheny Mountains, on a clear night, you feel like you could reach out and touch the stars in the sky. Seeing a falling star across the sky is a common site. If you want to see something really spectacular, there is nothing like sitting at a Pennsylvania drive-in theater and watching a meteor shower. Yes, I've seen and done it all. From tripping over a skunk in the dark to roaming around for almost an entire movie trying to locate my car. 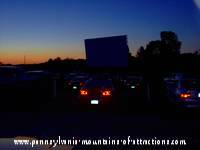 I thought I knew all there was to know about drive-in thearters, until the time our family went to the Carrolltown Drive-In Theater on July 3rd, 2005. On July 3, we drove up the mountain to Carrolltown, we were running a bit late and arrived 20 minutes before the first feature was to start. Tom Cruise in "War Of The Worlds" was playing that night, along with "The Longest Yard." I took my digital camera along. I never really took pictures at a drive-in theater before, of course, I never had a digital camera before. The first picture on this page is the one I took as soon as we got there. The second one I took about 10 minutes later. I really didn't give these pictures much thought until I attended the ghost hunt at the Altoona Railroaders Memorial Museum, in October. After learning about energy orbs and what they look like in a picture, I started going back through my digital pictures. I was shocked when I saw the second picture I took at the Carrolltown, Pennsylvania Drive-In Theater. It was full of ghostly energy orbs. As you can see, I honestly didn't find any in the first picture or the one I took after dark. Why, I don't know. If you look closely at the second picture on this page, what you might mistake for the moon is not the moon, it's an energy orb. Another one is on the side of the projection screen, and many more just floating through the air. I realize the energy orbs are hard to see in the picture here online. It's because I had to reduce the size for it to load fast on a web page. But if you look close you can see the energy orbs scattered about. Please note that these picture were taken only a few minutes apart, if that energy orb I pointed out would have been the moon it would have shown in the first picture. Many times I have ventured to the concession stand or restroom during the movie. It has always felt spooky wondering around alone in the pitch dark. I'm sure it will feel even more spooky the next time, after seeing those pictures. There is no doubt I'll be thinking of all those ghostly energy orbs floating around me. But it won't stop me from enjoying one of my favorite family past times. I will always enjoy the drive-in theater. I hope it won't stop you either. If you would like to see a haunted PA attractionthat is loaded with ghostly energy orbs visit the Altoona Historic Mishler Theater . You'll quickly see what I mean about ghostly energy orbs. The testimonies are pretty interesting too!